There are many baby swings out there in the market today. The popular ones like the Fisher Price cradle swings also do not come cheap. Therefore, when you are shopping for a swing, it can get overwhelming. You just do not know which one to choose and how much you should spend. Sometimes, they share more or less the same features too that you might have a hard time deciding between the one model and another. So, what should you look out for when buying an infant swing? What are the factors to take into consideration? Find out a few useful tips below if you are searching for a baby swing right now. When buying an infant swing, consider the features that you absolutely need. Identify what are your priorities and decide on which features you can live without. For example, the Mamaroo infant seat has 5 different motions for your to choose from. Do you need them all? Can you make do with fewer, or even one single motion only? Similarly, do you need a motorized mobile or are you happy with just a hanging toy bar? These and more are the questions you should ask yourself before making a purchase. Consider the pros and cons of each different swing and match them against your needs and preferences. A lot of people make the mistake of buying first before taking the time to learn what the swing can and cannot do. Learn everything you need to know first and by doing that, you will be less likely to be disappointed with your purchase. Next, make sure you check the dimensions of the infant swing that you are going to buy. Some swings can be very bulky in size and if you have a small living room, you might find it hard to fit one in. A cradle swing has a wide frame and base to maintain stability. As such, for those living in a smallish home, such a swing may not be an ideal choice. Keep in mind that you will also have other baby items that you need to get and altogether, they can cram up your living space. 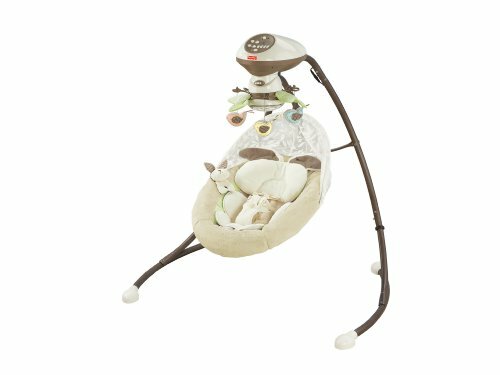 Rather than investing in a full-sized cradle swing, a better option for you in this case would be a portable or multi-use model. There are many baby items now which have multiple uses in one unit. For instance, you can get a high chair and swing as a single product. This not only saves you money, but also economizes on space. This model comes in a few designs although Luv U Zoo, by itself, is also a very popular choice among parents. Comes with 6 speed settings, songs and sounds to keep your baby entertained. This swing uses TrueSpeed technology, which means it will maintain its swing speed even as your baby grows bigger and heavier. It comes with a 6-speed setting. This swing is also by Bright Starts and it has 5 swing speeds. But it has a long battery life with its Hybridrive technology which makes your batteries last 3 times longer. Poll: Full-Size Or Compact Swing? Which would you rather buy for your baby: a full-size or compact swing? Lastly, consider whether you would need to move the infant swing from room to room often. 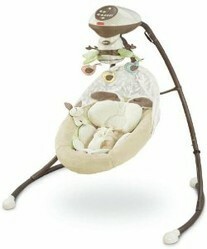 Generally, cradle swings are a hassle to move around while portable ones can be easily folded up to be carried. Furthermore, you can take a portable swing with you for visits to grandma's house and other outings. This is the benefit of a compact swing which you would not get with a full-sized one. Therefore, think whether portability is a must given your lifestyle and daily routine. Remember, what is a great baby gear to one parent may not necessarily be the same for you. The same goes when choosing an infant swing. What is important is that it can meet your needs and fit conveniently into your lifestyle. Do You Think You Can Live Without A Baby Swing? Babies love to swing, they fall asleep sooner in the rocking chairs also.